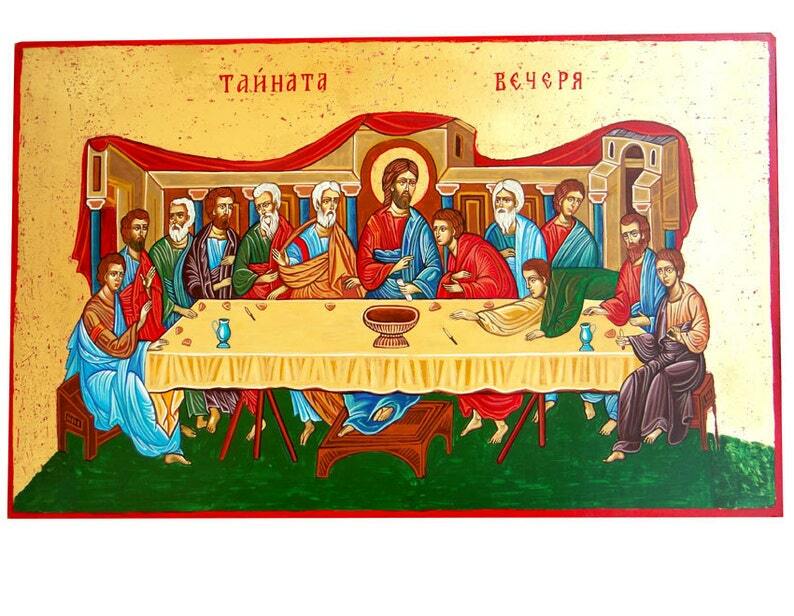 The icon depicts the last meal of Christ with his disciples before his arrest. Christ is the central figure at the table. The chalice containing the Precious Blood of Christ is on the table. The Evangelist, Saint John the Beloved, is seated next to Christ, as the youngest of the disciples, he is depicted as beardless. He receives in his left hand a piece of the Body of Christ; another morsel is on the table before Christ. Judas Iscariot the Betrayer is depicted dipping into the dish. PLEASE NOTE: THIS ICON IS A MADE TO ORDER ITEM! IT WILL TAKE APPROX 12-15 DAYS TO PAINT IT, BEFORE YOUR ICON IS READY TO SHIP! 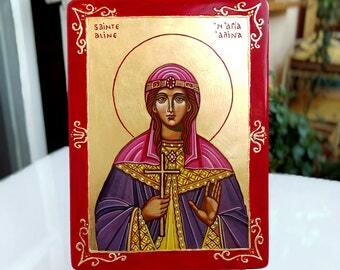 The icon is painted with tempera on stucco canvas over a wood panel. 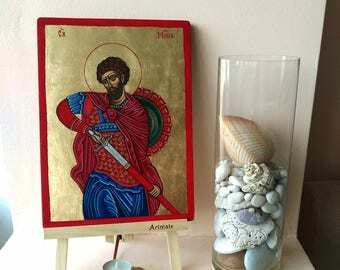 I used gold leaf for the halos and backround and sealed the icon with couple of layers to assure a long lasting image and to make it easy and safe to clean it from dust. Comes with a hanger on the back. This is just beautiful! Very well done, I LOVE it! Great customer service arrived earlier, simply beautiful thank you. More beautiful than expected. Love it! And shipping was prompt. If your icon was damaged while in transit, I take the responsibility to repair it at no extra cost, however the shipping expenses for sending it back to me are buyer's responsibility. You will not be charged extra for me sending the icon back to you. Refunds will be issued in case the icon is returned in its original intact condition and only after you have contacted me prior to sending it back. All inquiries for refunds need be communicated with me not later than 7 days of receiving the item. After this period a sale is considered final. Shipping costs are non refundable. Please do not send an icon back without notifying me first! The icons you are purchasing will be carefully packaged to assure they reach you in their original intact condition. Your icon will be shipped with Bulgarian posts by registered air mail within 1- 2 days after a payment is received. If it is Friday, the item will ship on Monday. You will be provided the tracking number of your package for further reference. After it leaves Bulgaria and enters your country you will be able to check the tracking number with your local posts or their online services. For the US it will be USPS. If you have a custom order, please allow about 10 days from your order date until it is shipped. You will be informed promptly when the icon is shipped and the expected delivery times. On the average shipping takes 5-12 working days for an order to reach countries within Europe, 10-25 working days to reach the US or Australia and 10-20 days to Canada. Please contact me if you want an upgraded (faster) shipping option! An extra cost of $2 will be added to the Shipping charges for priority mail. It does not however speed up the deliveries significantly, maybe only 2 to 4 days faster than the average times. Shipping costs include: Gift wrapping and packaging materials, actual postal costs calculated by the item weight and the extra costs for registered mail service. Please feel free to contact me if you have any questions or a custom order inquiry.